Ready, fire, aim is not a typo. It is a deliberate word play on the common phrase Ready, aim, fire. 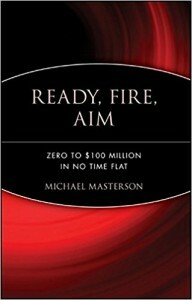 Written by Michael Masterson, this book describes the process of building a company right from the startup phase to an enterprise that earns millions of dollars. The title suggests that we should always start before we are fully ready to launch something and that we should never obsess to the point of perfection. By launching before the product is perfect, we are letting the market decide how to improve it rather than falling into the trap of hubris, where we falsely believe that we fully know the market.